It doesn’t matter how old you are there has been or will be a time in your life where you stay over at someones house and the next morning, sleepy eyed and eating candy for breakfast you will realize you need your essentials which you have inevitably forgotten. When I was younger me and my friends used to have sleepovers virtually every weekend and although I was quite young I still needed my necessities. I needed a survival kit. Therefore I am going to transport my head back 5 or 10 years and put myself back in to that situation where I desperately needed a sleepover survival kit to get me through the next day. Feel free to add in the comments below your essentials missing from this list! The top thing on my list is face and body wipes. They are essential when you can’t have a shower at someones house and you are feeling a little bit ‘dirty’. Face and body wipes easily slip in to your bag and make life that tinier bit easier the next day. Deodrant. I cannot tell you how many times I forgot my deodrant and the next day was a downhill spiral of regrets and smelling bad. Add deodrant to your list of essentials for your sleepover survival kit and you will be thanking me later! Concealer. I didn’t wear much makeup when I was younger but guaranteed every single time you wake up you have a spot. I don’t know if it’s something to do with late nights, bad food or good fun but, our bodies do it so, add some concealer in to your survival kit for next moring rescue! Gum. I can’t stress enough the importance of carrying some gum with you. I have forgotten my toothbrush on multiple ocassions and even if I hadn’t forgotten it, chances are we all fell asleep and completely ignored brushing our teeth. But the next morning you’re gonna regret that! So if you have a handy pack of gum stored in your survival kit you are going to feel just that little bit fresher. I am also not sure why you wake up with chapped lips, if anybody knows please let me know! But i often used to wake up with incredible sore lips so, the best thing you can do is carry around a small, replenishing chapstick. I don’t know about you but, my hair needs to be washed at the least every other day, it gets so greasy because I have oily hair and I always have. If you’re like me take a bottle of dry shampoo with you in your sleepover survival kit to spritz up your hair the next morning. I’m talking about moisturizer. It livens up your skin and once your face is clean will make you feel a million times better if you’re feeling a little rough. Of course above are my absolute essentials for the sleepover survival kit. 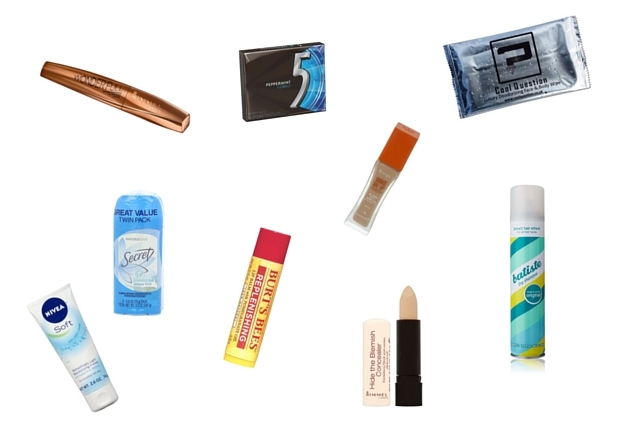 If you forget everything but these things you will be fine and you will feel fine but, below I have listed some makeup essentials to squeeze in to your bag. Mascara for me was an absolute essential. If this is all you have you will be fine!! It brightens up your eyes and makes you look way less tired. A definite necessity for a sleepover survival kit. As I said above we all get spots the next morning so I would definitely bring this in my survival kit. This concealer is for spot emergencies and covering up dark circles. If you don’t wear foundation, don’t bring it but if you do bring a light foundation that will make you look more awake and put together. This is a definite must in my survival kit and is the foundation I use ALWAYS. As bare minimum essentials go this is all you need. You could add in some bronzer or blush to make your face more put together but, if you’re just heading back home there’s no need. After all this is a survival kit!! If you have any room left I would definitely try and remember a spare pair of underwear and socks. If you can change them you will feel loads better the next day. One last thing, what is your sleepover essential?